Working online to make money is very nice and also acceptable by any law worldwide, Money is very essential in human life especially bloggers in the field of internet, which i do believe many website owners especially bloggers are just blogging to get some cash which actually led to the downfall of bloggers. well not working with any internet payable company and earn cash online matters, but how to get paid while leaving in Nigeria without any stress is the case. so as from today henceforward i do believe that, getting paid online is simple and easy as a result of the introduction of Payoneer. Payoneer is a financial services business that provides online money transfer and e-commerce payment services. 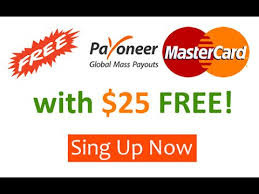 Payoneer is also a registered Member Service Provider of MasterCard worldwide which accept payment world wide through any means of payment. Let me introduce to you the number one accepted online money transfer and e-commerce payment services talking of Payoneer and also how to get its master-card while staying in Nigeria with $25 instant bonus if you received $100 payment from any company. Make sure you have a NIN number as contain on your national ID. It is simple just follow the bellow link and you are good to go. Fill the form as provided then, after the account opening you will be given $25 instantly as reward when you receive $100. Advise: computer is more preferable for the account opening considering the network problem.